One of the enhancements of SolidWorks 2008 that you might have overlooked is the revamping of SolidWorks Rx. The UI has now gone to a multiple tab interface that groups different features that can be used to maintain your system. When you open SolidWorks Rx (Start->All Programs->SolidWorks 2008->SolidWorks 2008 SPX.X->SolidWorks Tools->SolidWorks Rx) the Home tab is the default tab selected. It contains a summary of each tab along with a description of the functions that can be carried. 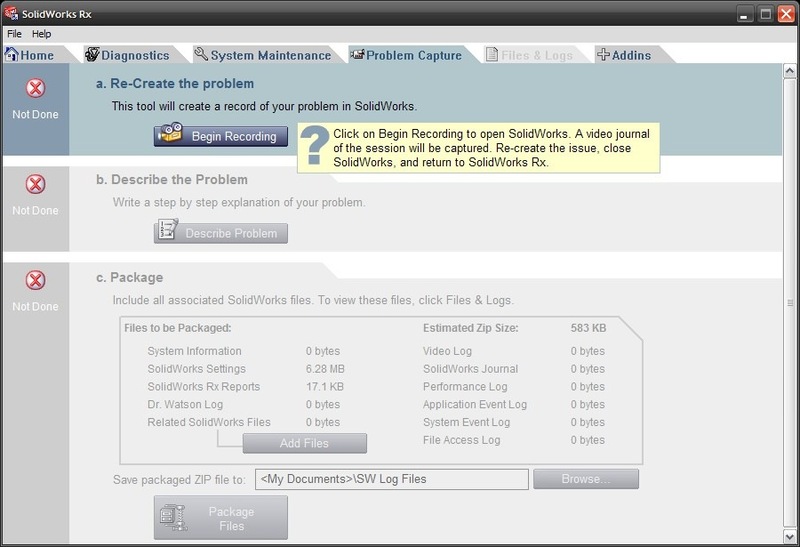 Also included are links to two different SolidWorks Safe Modes. 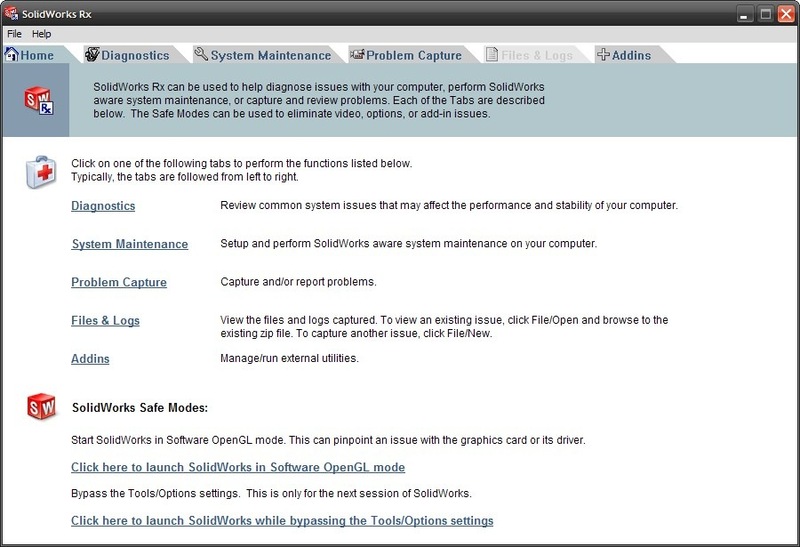 One Safe Mode launches SolidWorks in Software OpenGL mode which can help diagnose graphics card issues. The other Safe Mode launches SolidWorks while bypassing the Tools/Options settings. 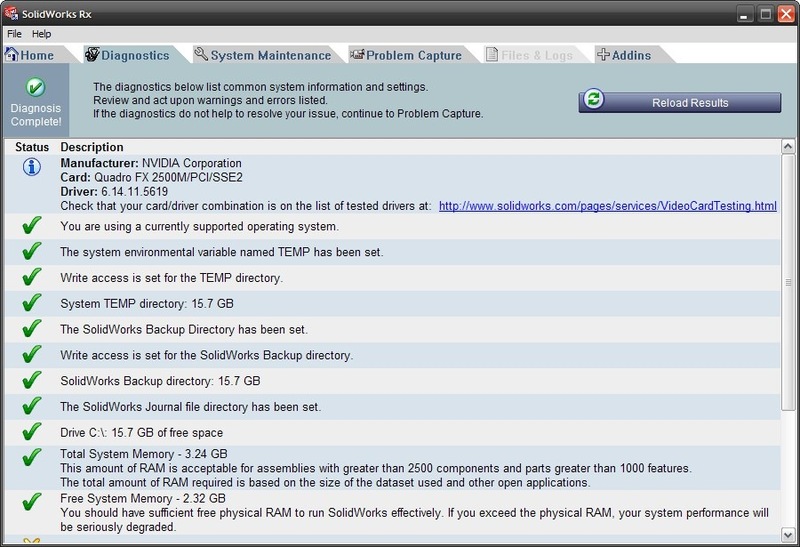 The Diagnostics tab lists some of your system information along with selected SolidWorks system settings. Also included are links to access the graphics card database and Installation Guides on the SolidWorks web site. The System Maintenance tab contains MANY useful tools to help keep your system running in the best condition. 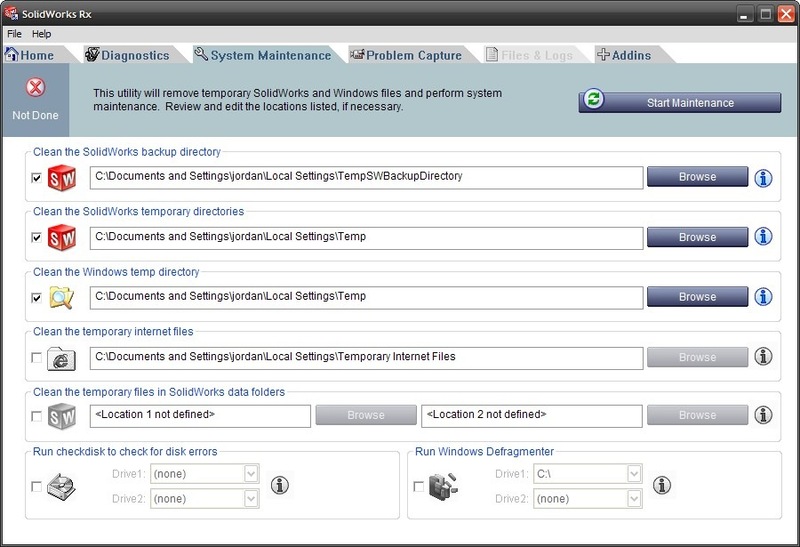 From this interface you can clean the SolidWorks backup directory, SolidWorks temp directory, Windows temp directory (this will clean the system temp directory – not just the SolidWorks related information), & temporary Internet files. It also includes two custom data folder locations that can be set by the user to clean temporary files. There are also links to run both Windows Checkdisk and Windows Defragmenter. 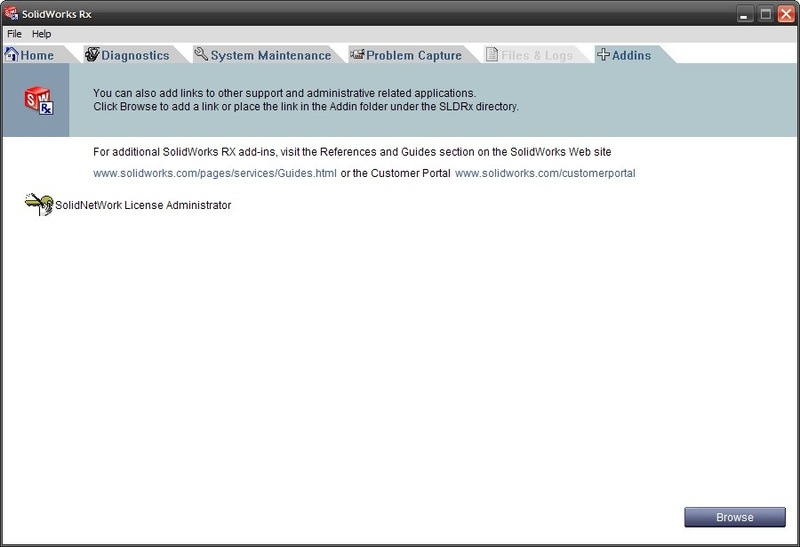 The Addins tab allows the user to add links to other system maintenance utilities or Windows executable files You can see in the example image I have added a link to the SolidWorks License Administrator. Having all of these tools in one interface will prove useful for both system administrators AND users alike. Estou enviando meu curriculum e alguns desenhos executados no solidworks 2007.